Be the first to share your favorite memory, photo or story of Lettie. This memorial page is dedicated for family, friends and future generations to celebrate the life of their loved one. 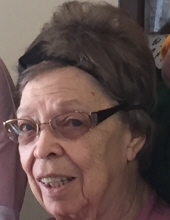 Lettie Annamae Hansen, age 81, passed away January 13, 2019 at Community Memorial Hospital in Missouri Valley. She was born in Council Bluffs on April 9, 1937 to Ivan and Sarah (Thompson) Boren; who preceded her in death. Lettie was a 1955 Thomas Jefferson High School graduate and attended IA Western Community College for two years. On June 29, 1957 she and Jerry Lee Hansen were united in marriage. Lettie worked as a personnel record’s secretary with the National Parks Service for twelve years. Lettie is survived by daughter Jodie Ellen (Bruce Jr.) McFadden; sons John Lee (Ellen Rogers) Hansen, Thomas A. Hansen; daughter Christine Evelyn (Jeremy) Kain; grandchildren Shannon Evans, Bartholomew Scott Hansen, Cody James Hansen, Dallas Scott Meck, Tyler Kain, Christopher Jeremy Kain, Justin Kain, Emma Lucille Hansen, Felicia Kain; great-grandchildren Mussena and Conner Evans, Harlee and Axle Kain; sister Nancy Poffenbarger. To send flowers or a remembrance gift to the family of Lettie Annamae Hansen, please visit our Tribute Store. It was Lettie's wish to be cremated so there will be no viewing. "Email Address" would like to share the life celebration of Lettie Annamae Hansen. Click on the "link" to go to share a favorite memory or leave a condolence message for the family.